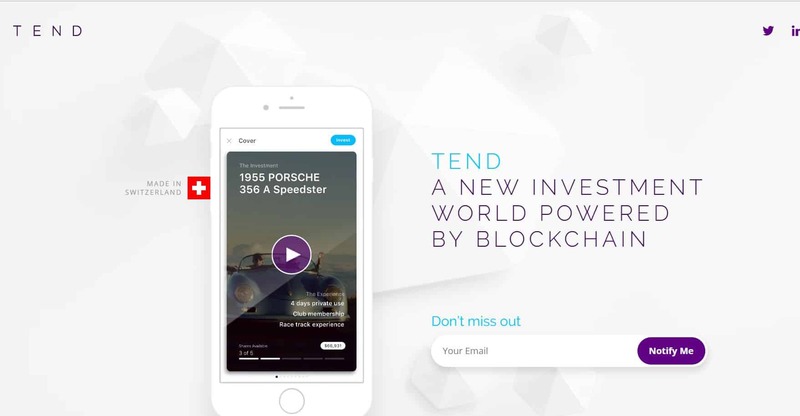 TEND, a blockchain-powered platform for life-enriching investments, was launched today by former Credit Suisse Chief Digital Officer Marco Abele. Featuring former UBS and SAP Group CIO Oliver Bussmann as a Strategic Advisor, the Ethereum-based project will enable a new paradigm of shared ownership of unique assets with both meaning and financial value. Using TEND, small networks of likeminded individuals will be able to connect and share their passions as well as earn a potential return, allowing them to invest in their interests while diversifying their wealth. Offering a full-service, concierge-like experience, the platform is carefully designed to both protect and service the assets while, by utilizing blockchain technology, providing a transparent, trustworthy and secure basis for investment. Through so-called smart contracts, TEND will grant customers co-ownership of assets that were previously beyond their reach, while uniquely allowing them to both experience and enjoy these assets. “Many people today are finding that there is more value in experience than ownership, and that it is about access to fine things, not just possession of them. At the same time, conventional investments have become uninteresting for the modern generation. That makes meaningful, special assets increasingly desirable and hence valuable. TEND was born out of the opportunities presented by these two trends,” said Abele, TEND Founder and CEO. Having already built a working alpha version of their product and tested it with a group of early users, TEND also announced today that it will hold a financing token generation event in the coming months. The TEND token generation event – which aims to be fully regulatory compliant – features the first-ever cryptotoken to be structured just like a conventional bond under Swiss securities law. To ensure transparency, TEND will make details of its token generation event and the intended use of funds available to all investors. “TEND’s forward-looking philosophy is reflected in our funding strategy. Token generating events are, we are convinced, the future of financing innovative new ventures like ours. We are very happy to be spearheading these developments,” said Abele. Oliver Bussmann, Founder and Managing Partner of Bussmann Advisory and globally recognized technology thought leader, has already started working with TEND as a strategic advisor. A renowned blockchain pioneer and expert, Oliver will bring his enormous depth of insight and experience to the venture. “I am delighted to have a like-minded digital thought leader of Oliver’s calibre joining TEND. We both share the drive to push the boundaries of what is possible by utilizing blockchain technology, and the TEND team looks forward to working closely together with Oliver as we continue to turn our vision into reality,” continued Abele. TEND’s unique strength is in its leverage of the rise of transformative, new distributed ledger technologies and smart contracts, applied to real life assets. A self-acclaimed ‘customer-fanatic’, Abele’s vision is to give a far wider audience access to a new world of meaningful wealth driven by purpose and emotion. For more information visit TENDswiss.com.